Newly Published Work! 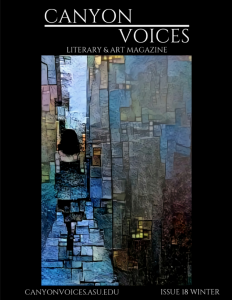 Proud to announce my publication in Canyon Voices Literary and Art Magazine. The journal’s winter issue (#18) has one of my short stories and two of my artworks inside. Thanks to Rachel Passer, one of the editors, for all of her help, and Canyon Voices for this opportunity! Rachel’s Instagram is @rj.passer, and find Canyon Voices on Instagram here: @canyonvoiceslitmag.